On Endurance Corner, you can find background to how, and why, I use couple retreats. I’m back from a week away with Monica – this is the third quarter (in a row) where we managed to spend a week together, outside of our normal lives. The pull of technology amazed me – it took five days for me to lose a powerful urge to check email and google news. I’ll need to do a better job with communicating my break next time as I inadvertently left a couple people in a lurch. Creating a life where I can take frequent, extended breaks from email is on my to-do-list. Email contains my least productive hours but is a key communication route for a few people that are important to me. Two years on from starting inbox zero, I’ve made progress. On my last email break (15 days, January 2011), I came back to thousands of messages that required days of sifting. The insanity of that life gave me a huge incentive change. This week I came back to 175 messages, which took me an hour to sift down to 42 that I’ll action. I have a filter set up for athlete workouts and that’s another 235 messages to review. In two years, the changes I’ve made have freed up the equivalent of one working day per week and I know that I’m still improving. The key question that I asked myself: In my working life, where do I add the most value? Helping highly successful people optimize their time, learn from errors and structure their lives to achieve their goals. Then I made a list of items that take my time that don’t directly contribute to the three key areas above. My action list for May is delegating/subcontracting those items. Another way to ask the same question: Why am I paid to be on the team? Considering my personal life, what does my spouse love doing with me? As it turns out, Monica loves unstructured, unscheduled time with me – and the opportunity to do her own training each day – and some time alone to read. At our core, we are very similar. Two years ago, I asked the question: What skill, if learned to the best of my ability, would change my life? Contemplative study to enhance my ability to be clear in thought, advice and action // essential for me to be the man I want to be. Having spent the winter doing strategic planning, the main insights were about staying-the-course and areas where I can prune/simplify my life. One of my favorite authors is Gordon Livingston. In his book on love, he advises us to consider how others make us feel. I’ve extended the advice to consider more than just people (situations, types of food, language, daily actions, websites). I’ve changed my life by trimming little stressors in my life. While I am aware of the trap of seeing the source of emotions coming from outside my mind, taking responsibility for the situations in my life has been both useful and empowering. Another favorite author, particularly on business and investing, is Charlie Munger. Munger’s key tip is “always invert”. By this, he warns us to consider what-if the opposite happens. 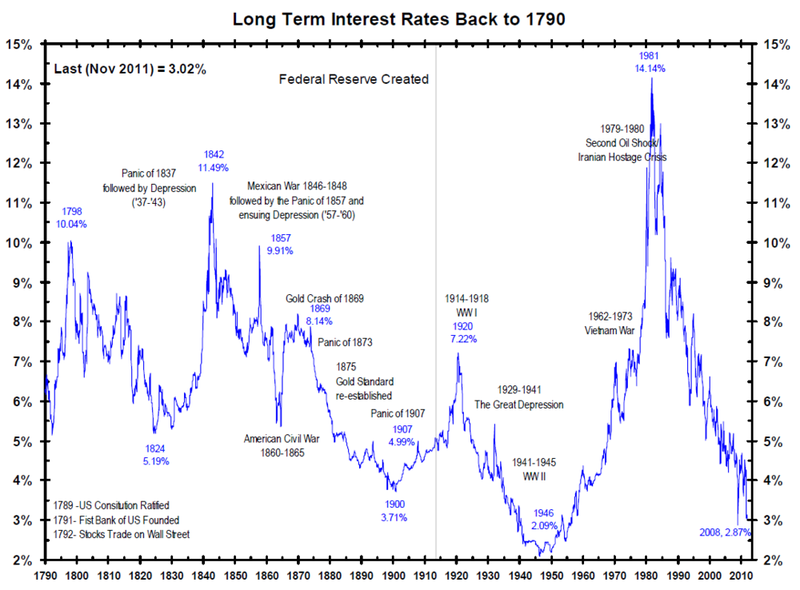 My chart two weeks ago on interest rates is one indication that I’m likely to see large, unexpected changes in my lifetime. How’s this situation making me feel? How am I impacting this situation? Inverting… How do I feel when I’m not in the situation? Inverting… What impact can I have elsewhere in my life? Each time I realize that I have a choice not to participate is a breakthrough. I can get caught up in emotional tennis – batting situations back-and-forth, without end, deepening a pattern of stress and conflict. Remembering that I have a choice to remove myself, or simply take a break for week, can lead to meaningful change. Even when life is calm, I like to step outside my routine to gain perspective. My wife and I are going through a transition with our children arriving so this week we are taking a cybervacation and spending it with each other. Our agenda is to discuss family strategy and consider how we would live if we knew we were going to die… …a trick question that I frequently ask myself. At the beginning of March, I wrote about internal and external motivation. The combination of motivation and persistence (with ability) is what generates success. Success then sets up positive reinforcement of additional effort and persistence. The challenge of moving through a transitional phase (like fatherhood) is a desire to follow past models for success. This week, I will share some tactics that have helped with my own transition. Before I was married, my capacity to strip away and create a sole focus served me well. It was easy for me to create long periods of serenity in my life. With my life filling up with dependents, periods of serenity have become more valuable. Over the winter, I asked myself what I could give up to create space. I’m going to share my list but the real value is knowing your own list. Ditched running so that I could ride more – it’s more enjoyable to be a superior masters cyclist than an undertrained triathlete. Solo rides are serene and cycling is my main interaction with my buddies. Invited a friend to partner with the operations of a company that I founded – I realized my mission is writing and teaching, rather than admin and financial return. Cleared half of my personal stuff – this was surprisingly easy, which may mean that it’s time to do another 50% reduction! Facebook – I took a break in March and I don’t think it’s coming back. Everything that I gave up had value to me. Most importantly, it’s very difficult to value serenity, lack of clutter and time to think. So the payoff is difficult to see immediately. Six months in, we’ve made real progress. The key moment, that caused me to accelerate change, was the realization that I could live with being far less externally successful, so long as I was internally successful. What can you give up to create the life you desire? When I left my private equity career in 2000, I was able reduce my annual expenditure 90% by moving from Hong Kong to New Zealand. I bought a five-bedroom house for US$25 per sq ft (those were the days) and the income from that property covered my housing expenses. Kiwi health care is government funded and I purchased a top-up policy for my travels. At the time, my Dad advised me to “take the number that you think you need to retire and triple it.” In 2000, I had neither the desire to retire nor a particular number in mind. His advice proved accurate as I gained clarity on what’s required for me to retire, at any given point. 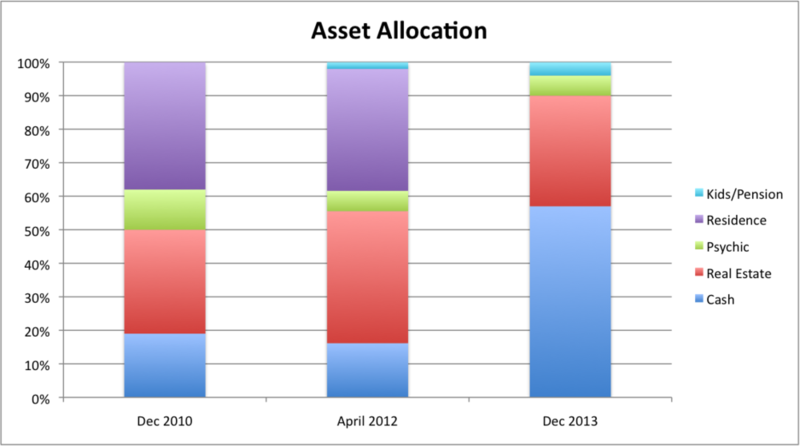 The last time I wrote about asset allocation was December 2010. I shared that my split was 50:50 between assets with postive returns (investments) and assets that had a psychic return. A psychic return is another way of saying the assets depreciate, or cost me money to hold. Like most people, our house is the largest asset in the family’s balance sheet and the true cost of that asset has been weighing on me. I’ve decided to scratch the itch, sell the house, free the family from being tied to any one location and reallcoate the capital to something productive. It’s been a fascinating study of human psychology as I’ve been living through my biases. Right now, we are in the middle column transitioning towards a more liquid position. The pain that we take is leaving our existing house. The benefit, of improved financial health, is invisible to my wife and kids. My daughter’s main concern is bringing the cats to any new residence, so I have her covered. The other major change I have started is allocating capital for my kids’ education, they have 529 accounts, which let gains roll up tax free. I made an error when we started saving for the kids by using a minor custody account, rather than the 529 vehicles. Both the kid’s accounts invest in a low-cost index fund of US equities. I’ve taken a twenty-year view of the markets on their behalf. Over the last three years, I made a decision to allocate the family’s earned income to a business owned by my wife. This enabled us to start a 401k for her and get her credit rating established. A project for 2012-2013 is setting me up in a similar fashion. The kids/pension allocation will likely tick up by 2% per annum and be mainly allocated to equities. In a high tax, high rate environment, previous allocations into tax deferred vehicles will be valuable. I lifted the above chart from Barry Ritholtz’s Blog. Ever since I saw that chart, I’ve been asking myself where I want to be when conditions shift back to normal. Conditions are going to shift eventually and we, collectively, give too much weight to the last three years of extremely low rates. I’m shifting to cash equivalents to give myself the choice to spend that money (gradually) while I allocate more time to my family and wait for conditions to return to normal. Also, that gives me the flexibility to move quickly if there is another unpleasant shock. My property portfolio was purchased in a four month period when conditions suited me. I’m willing to foresake a lot of upside, and endure considerable hassle/pain from moving, so that I can be relaxed around the house and have time to love, write and ride. There’s a leap of faith that I’m going to forget the current pain in a few years time. I enjoy reading old blogs so this is a reminder to myself to check back in.